Women in Philanthropy began in 1995 under the leadership of Pat Knaub, then dean of Human Sciences, and was organized under that college’s umbrella. It was evident to Knaub that women were missing from leadership positions on campus and she sought a way, through education and motivational experiences, to catapult women into leadership and philanthropic roles. Unfortunately, due to lack of resources and shifting priorities, the Women in Philanthropy program ended in 2004. Knaub’s passion for leadership and philanthropy, however, remained strong. After retiring as dean in 2007, she reignited the program, and together with 40 founding members, launched the Women for Oklahoma State University Leadership and Philanthropy Council in 2008. Our inaugural WOSU Council understood the opportunity before them. They found similarities and commonalities among them and used these values as their base. Their focus was on the power of partnerships and unity. The group further understood that while collaboration could take more time, the outcome would be more sustainable, and that transformation would happen at the speed of trust. 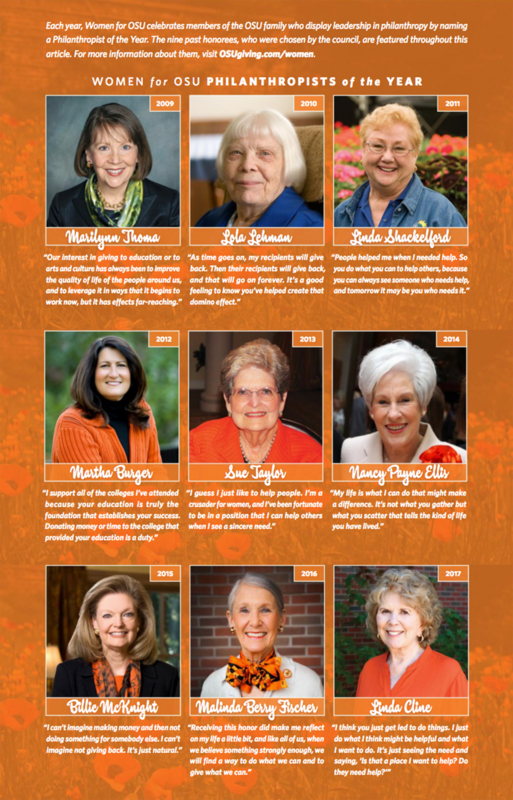 Thanks to Knaub’s visionary leadership, the OSU Foundation’s Deb Engle, and the council’s founding members, Women for OSU is celebrating its 10-year anniversary and is stronger and more vibrant than ever before. Women for OSU has held nine annual symposiums. At its first event on April 23, 2009, approximately 250 people watched student Sarah Cary receive a $2,000 scholarship in the Wes Watkins Center. Compare that to the ninth symposium on April 27, 2017, when more than 500 people witnessed 10 students receive $43,020 in scholarships in Gallagher-Iba Arena. 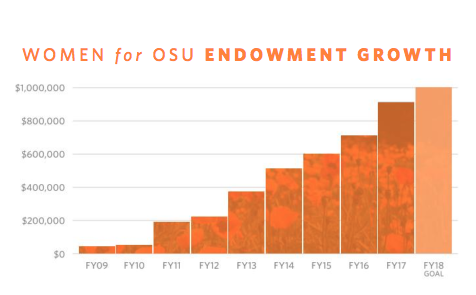 The Women for OSU scholarship endowment has seen increased growth every year exceeding $900,000 in 2017. Since that first symposium in 2009, the organization has surpassed 3,000 total attendees at its events, including symposiums and regional gatherings. It has awarded $187,370 in scholarships to 49 students and recognized nine Philanthropists of the Year. Additionally, the group’s scholarship endowment has grown to $912,837 with a goal of reaching $1 million by its keystone 10th annual symposium, scheduled for April 5, 2018, inside Gallagher-Iba Arena. For WOSU, the collective focus and attention is on unity — how they, as a council, can benefit Oklahoma State and inspire leadership and philanthropy in countless other communities. Today, women view philanthropy not so much “giving” as “investing” — investing in change, investing in the future and investing in causes that are personally meaningful. 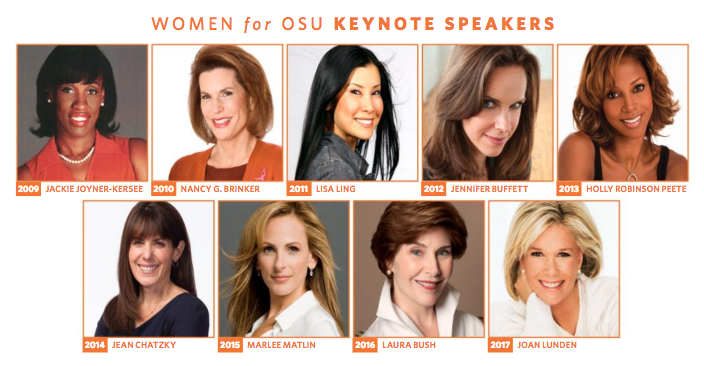 Women for OSU hosts multiple regional events each year to foster connections and inspirations ignited at the symposium. 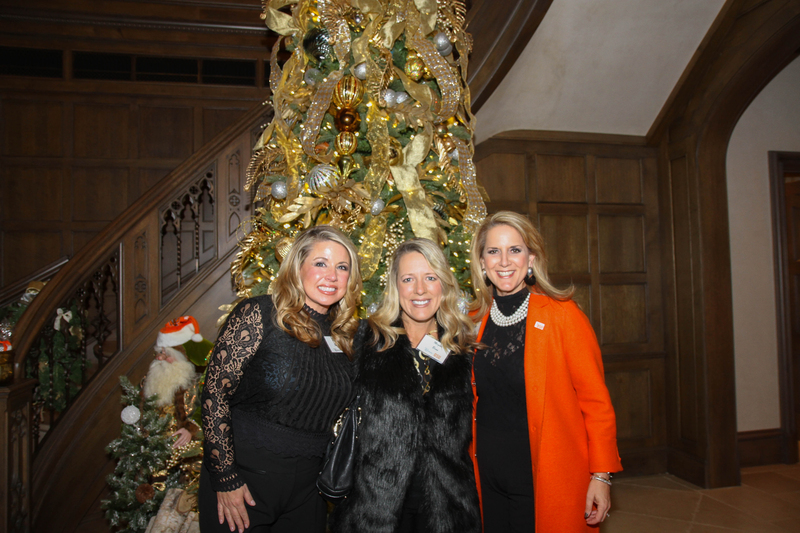 At the December 1, 2016, Dallas regional event, council member Jami Longacre, right, connected with Raquel Schmitz, left, and Megan Benn. During her 2012 symposium keynote address, Jennifer Buffett reminded the audience that “philanthropy” is derived from the Greek “philo” (loving) and “anthropo” (people), and it is the love of people that propels the WOSU Council forward. These women love their communities and the people who fill them. They dare to dream and do, to make the world a better place. One of the council’s chief initiatives that fosters a culture of giving and service is Women for OSU’s annual spring symposium. It is a unique opportunity for leaders to gather in Stillwater and be inspired by philanthropists and student leaders, and to share personal stories of philanthropic journeys. Symposium attendance has increased dramatically over the years — a testament to the power of women’s philanthropy and leadership. The first symposium took place at the Wes Watkins Center in 2009. It then went to the ConocoPhillips OSU Alumni Center for five years before moving to the Student Union Ballroom in 2015 after it outgrew both previous locations. In 2016, just one year later, attendance grew to over 500, and the location moved again to Gallagher-Iba Arena. One of the reasons for the event’s high demand each year is the impressive keynote speakers. Former First Lady Laura Bush, actresses Marlee Matlin and Holly Robinson Peete, journalists Joan Lunden, Lisa Ling and Jean Chatzky, Olympic legend Jackie Joyner-Kersee, and philanthropists Nancy G. Brinker and Jennifer Buffett have all made appearances. The symposium also honors the Philanthropist of the Year, with the award given to a member of the OSU family who displays leadership in philanthropy. Each year, attendees hear the personal story of an OSU philanthropist and the motivation and experiences behind her giving and service. This award, and the inspirational lessons these women teach, has become a hallmark of the event. Year after year, responses are the same: Women leave the symposium feeling more inspired to give and impact change than ever before. Each year, past scholarship recipients return — and more than 90 percent have become donors themselves. While it’s easy to see the tangible growth the organization has experienced, what may be less obvious is the national trend regarding women’s giving that Women for OSU represents. In the last two decades, there has been a national movement to engage women for greater leadership and philanthropic roles in their communities and higher education. Research and studies consistently show women are the primary decision-makers when it comes to charitable gifts. It is irrefutable that women philanthropists are making an impact at OSU: As of last spring, the 43 current council members had given more than $120 million over their lives to support various needs at OSU. Women for OSU, its symposiums and additional activities celebrate and encourage women to follow their passions. One of the organization’s responsibilities is to empower the next generation, paving the way for others to give back and shape the future. To foster the connections and inspiration ignited at the symposium, WOSU hosts multiple regional events each year. These have been held all over the country, including in Los Angeles, Washington, D.C., Dallas and Scottsdale, Arizona, as well as in the Oklahoma City and Tulsa metropolitan areas and throughout Oklahoma. The WOSU Partners Program also provides women with a great opportunity to connect with others passionate about OSU. Women are stronger in their giving together, and Women for OSU invites you to become a WOSU Partner. 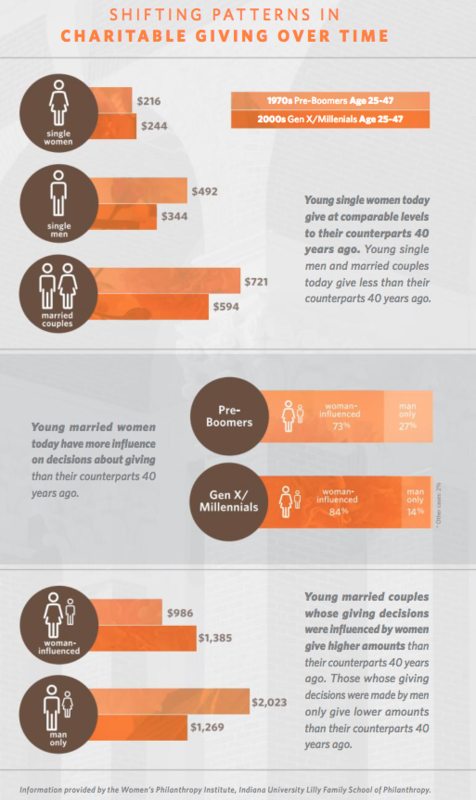 A new option of a minimum annual contribution of $500 is now available for those ages 35 and younger to become Women for OSU Partners. For more information, including a listing of our current partners, visit the Women for OSU Partners page.